Okay, time for some review. If you had to guess, what state of matter is shown in this atomic force image? Hint: It is crystalline. 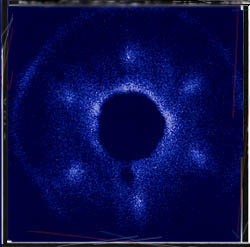 You can tell because the bright spots (atoms) are in very ordered, symmetrical positions. Ask yourself: will this material hold its own shape or take on the shape of its container? How is Science different than other ways of knowing? What causes the water to Rise? Density Demo: Flag in a beaker. Laws and Theories: What's the diff? Complete this Early developments worksheet for 25 points extra credit. P.12.A.2: Elements in the periodic table are arranged into groups and periods by repeating patterns and relationships. 7 Periodic Table and Periodic Table assignment. P.12.A.9: The number of electrons (relative to protons) determines whether a given atom is neutral or charged (an ion) Lecture Notes and Review Quiz Game. Quiz: Compounds, mixtures, atomic theory, periodic table. Bonding Types: Sharing or stealing? P.12.A.6: Students know chemical reactions either release or absorb energy. E/S Lab 6: All in the family: Periodic Trends.